For players arranging for air travel, the Greater Rochester International Airport (Monroe County – ROC) is the closest airport. Please inform the tournament director of your arrival details so arrangements may be made to pick you up. Take I-390 North to Exit 17 (Scottsville Rd). Take a left at the light at the end of the ramp onto Scottsville Rd. After half a mile, Scottsville will end in a “Y”. Bear to the right onto Elmwood Ave. After less than half a mile, bear to the left to enter the University of Rochester. 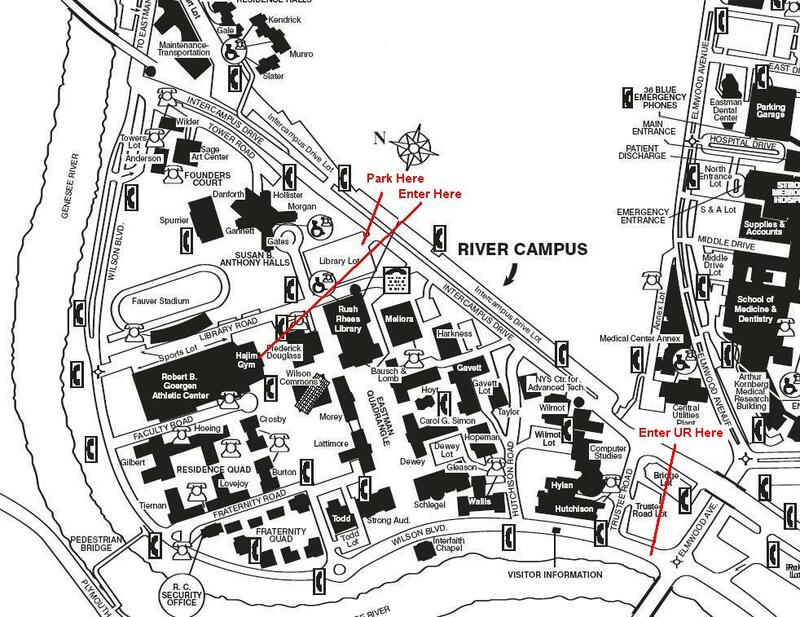 Refer to map below for directions within the University campus. NYS Thruway (I-90) to Exit 46; I-390 North and proceed as from the South. Parking spots are reserved at the Library Lot. To pick up a parking pass, stop by the visitor information booth as you enter the University and identify yourself as a player or host/volunteer. These permits are only for players, hosts and volunteers.